The super-talented Tina Matthews has created a story that immediately brings readers into its theme. How many times as adults, have we said the word ‘later’ to our children or others when they’ve asked for something, but we were busy doing something else? This poignant story is about Nancy wanting attention, and asking each member of the family for some of their time. But every one of them is occupied with their own activity or work. When? She asks. Later, they all answer. Later seems far away to Nancy. She climbs the tree outside, and from high up has a bird’s eye view of everyone going about their tasks. She imagines the tree and branches talking to her. She rocks and swings, wriggles and giggles until the moon comes out. Later arrives. But where is Nancy? Matthews’ creative and highly imaginative translation of her story is depicted in wood cuts and stencil illustrations. A medium she excels at. The silhouettes of the child on the opposite page to the coloured illustration reflect her isolation from all the people and activity that’s going on within the house. 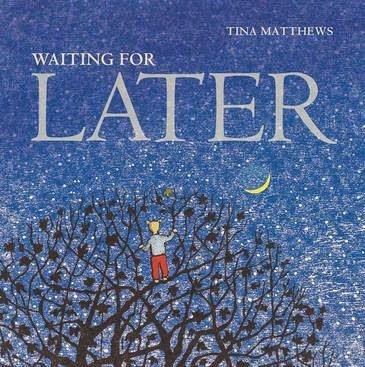 This speaks volumes about the child’s feelings and deepens the sense of meaning about the effect of the word ‘later’. But there is a happy ending.